We have just received wonderful news! We have been awarded a grant from the Jordan Cove-Grant Program for $3700. With cold weather hitting us now, we greatly need a furnace for our new building to protect the vehicles we have and to allow us to utilize our space for exhibits. We wish to thank the people from the Jordan Cove Grant Program for these funds which will enable us to purchase a hanging gas heater for our building. This grant could not have come at a better time! The South Umpqua Historical Society had its quarterly meeting on August 7, at the Museum in the Pickett building. I heard it was very hot.It was reported that our general meeting will be held on November 6 in Azalea at the Heaven On Earth Restaurant at Quines Creek.The owner, Christine Jackson, said she will provide meals, from the menu, at a discounted price. This would normally be a potluck in Glendale, but there isn’t a place to hold the meeting. We will begin at 1:00. The electrical wiring is being worked on in the Pickett building. But, our grant for the solar project from the Pacific Power Blue Sky was not funded, boo hoo! 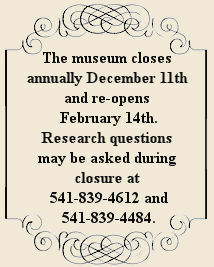 We all need to support our museum. Think about an ‘end of the year’ or maybe a ‘beginning of the year ’donation or a pledge of so much a month or year. The Cow Creeks just awarded us with $4000 for our 2017 utilities, but we need another $4000 to pay the bill. We really could use the help. The Cow Creeks are also helping us with the funding for our wonderful receptionist, Ruth Ann Shuman. She’s great and we wouldn’t be open without her. They built for us, from scratch, the Plank House, which is one of the favorite displays at the museum, especially with the younger set. THANK YOU, THANK YOU SO MUCH, Cow Creeks. We really appreciate your help. Our book of pictures, games and info about Oregon are for sale at $5 with a box of crayons. So far we have sold about 20. So, What Else is New! The new exhibit of old’ switchboards’ is on the main floor. These original telephone switchboards were used by the City of Myrtle Creek. Marvin Cornutt was the early operator. The switchboards were donated by Jim St. Onge. There is also a picture of our member Joan Barnes when she was a switchboard operator in Portland about 1953, along with some instructions on how it worked. Another new item is the ‘Flour Dresser’ in the Matthews building. It is a mechanical device used in grain mills for bolting. Bolting is the process of separating the finished flour from bran and dust after milling , using a centrifugal reel or flour dresser. The fiftieth Pioneer Days has come and gone, but it was great. Our princesses looked so good riding on Lonnie Nichols’ old hay wagon. Our royal court for 2016 along with our Pioneer Mother, Sue Shaffer, was Tracy Briggs, Kathy Ronan Brown, Diana Dailey Denton and Christine Deaton Morgan. What a great looking court! We have the Pioneer Days book at the museum for this year and next year will by The Book’s 50th Year. If any of you have a good idea for an article, just let us know. This will be a special edition. 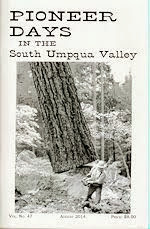 The South Umpqua Historical Society’s next membership meeting will be SUNDAY, NOVEMBER 6 at 1:00 pm in AZALEA at the HEAVEN ON EARTH RESTAURANT. We will chose from the menu, it will NOT be a potluck. 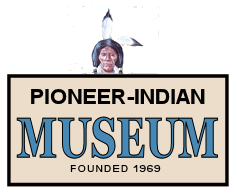 The Pioneer Indian Museum has much to be thankful for this November. Funding for the operation of our facility is becoming difficult to acquire. The Cow Creek Tribal Board answered our appeal for help by contributing $4,000 which will pay half the cost of museum utilities for the year 2017. We are so grateful for this help and for the tribe’s continued funding of our docent payroll. The plank house, constructed by the tribe has become one of our more popular exhibits. One of our goals for this fall is the construction of three flag poles which will fly the United States National flag, the Oregon flag and the Tribal flag of the Cow Creek Indians. The Indians have provided us with a beautifully colored 4’x6’ flag to display. Thank you.